This stunning example of the Audi A5 is fitted with the S-Line styling pack which features an upgraded body. included with this A5 are heated leather S-Line seats. Included with this A5 are Satellite Navigation with Traffic Reports, Bluetooth telephone and media use, Parking Sensors for the front and rear, Bluetooth telephone and media use, DAB Digital Radio, Audi Jukebox and dual zone Climate Control. Also featured on this A5 are an automatic Start/Stop system, Cruise Control with a speed limiter, Arm Rests for the front and rear, Central Locking, a multi function S-Line Steering Wheel and Drinks Holders. This car has been well treated and kept in great condition. This fantastic example of the Audi A5 is fitted with heated leather seats, Cruise Control with a speed limiter, Bluetooth telephone and media use, DAB Digital Radio, Parking Sensors fr the front and rear, dual zone Climate Control, a multi function Steering Wheel, Arm Rests for the front and rear and Drinks Holders. 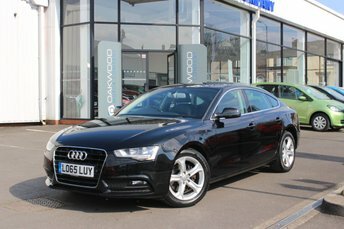 Also featured on this A5 are Central Locking, automatic Lights and Electric Windows for the front and rear. This car has been well loved and regularly serviced by its only owner. From the flowing lines of the coupé to the open-top fun of the cabriolet, Audi's A5 range can delight and thrill with ease. The quality interior is typical of Audi and the A5's standard kit makes this model exceptionally easy to live with. Turn to a used A5 Sportback if you require the practicality of a five-door vehicle, or give in to the additional power and performance that's on offer with the S5 models. 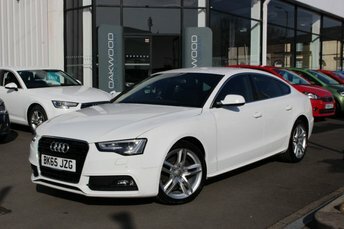 You'll find a great selection of used Audi A5 cars for sale in Manchester right here at Oakwood Motor Company Ltd. View our range online before contacting a member of the showroom team to discuss your requirements in more detail.